Protects laptop/netbook from dust, shocks, bumps, scrapes and scratches & spills. Double sides design allows you to simply turn the bag over for a different new look. 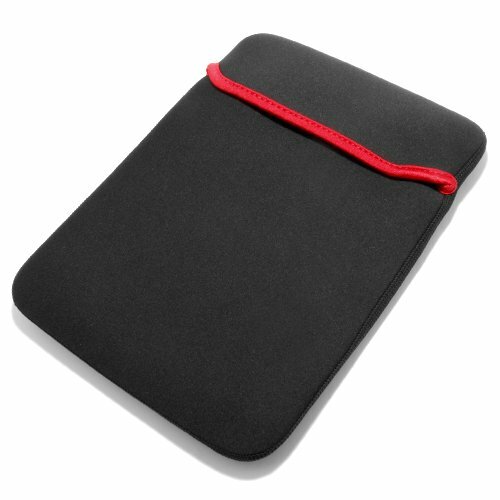 Slim Sleek design protects laptop on it's own or you may slip it in your bag or backpack. Limited Supply for this item so buy it now before our supply run out! It's A "Gotta Have" Item To Everyone! The description of the product could of been a little clearer. It is indeed 'black and red' as described- ie. all black with the red edging on the flap. However, it also says 'reversible for a different look'- I took this to mean it was red on the other side, but it's really gray with the red edging. My 15.6" laptop fits nicely inside. I was a little disappointed in that the thickness of the sleeve is thinner than I expected- I'm not sure it would protect the laptop from a hard bang, but it seems adequate if you are handling it carefully. Reversable? don't think so... 15,6"? Never. Who controls sellers offering things they are not really selling? My 15.6" Toshiba doesn't fit on it. Very dissapointed. The sleeve itself is exactly what I needed. Thin, cushioned, good enough to protect against minor bumps and scratches when I carry it around in my backpack. However. It's described as "Reversible". It's not. It's black on both inside and out with red trim. That's it. Now, you can still flip it inside and out. That part, yeah, it's reversible. But it doesn't have a different pattern or anything. It's the exact same thing. Despite this, it's what I was looking for and well worth the very small price I paid for it. If you're not looking for something pretty or unique, it's what you need.